The J.D. 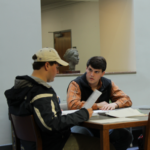 Williams Library is a very popular place to study. Please observe the noise policy on each floor. 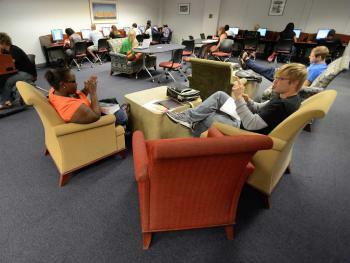 There are numerous study types of study spaces in the Ainsworth Commons. There are many PC’s and Mac’s available. The Ainsworth Commons is our newest study area. Outlets are available near most work areas. The newly remodeled area has been named the Ainsworth Commons to honor donors Oscar Richard and Edith Wetzel Ainsworth. The couple’s estate provided close to $1 million for long-term library funding, with a small portion going toward the commons project and the remainder being placed in an endowment. Enter the J.D. Williams Library from the West (fountain) side or come down the stairs if you enter from the second floor east (Lyceum) side. The Information Commons is located in the center of the first floor. The “Entry Cove” area of the J.D. Williams Library offers 16 public computers and an area for study or quiet discussion. Enter the J.D. Williams Library from the West (fountain) side and the Entry Cove will be immediately on your right. There are numerous study spaces scattered around the first floor of the J.D. Williams Library. If you prefer natural light, tables and carrels are available under the skylight. Talking is allowed on the first floor so it is a great area for group work. Outlets are available near most work areas. Enter the J.D. Williams Library from the West (fountain) side or come down the stairs if you enter from the second floor east (Lyceum) side. 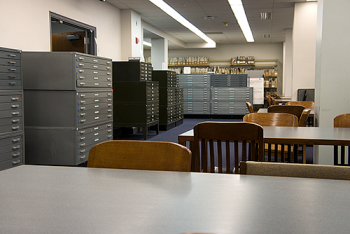 Many study areas are available along the stacks. 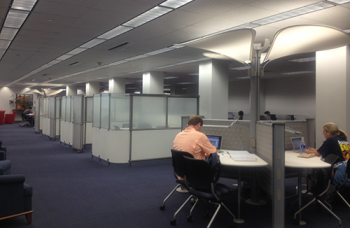 There six group work cubicle study spaces in the Information Commons. These areas are perfect for working on a group project. Each cubicle has a large table, chairs, a PC attached to a large TV display. Most cubicles can accommodate six to eight people. These spaces are enclosed but do not have doors. The are available on a first come first served basis and group work has priority over students studying alone. Enter the J.D. Williams Library from the West (fountain) side. The Information Commons is located in the center of the first floor. 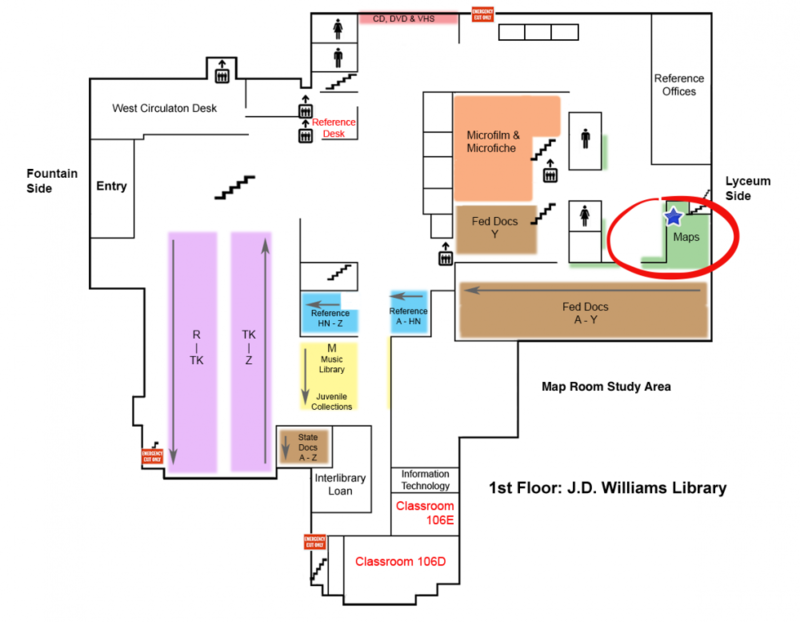 If you come in on the second floor east (Lyceum) side, come down the stairs and turn right. Go through the Ainsworth Commons to the Information Commons. The group work cubicles are on the East side of the Information Commons. 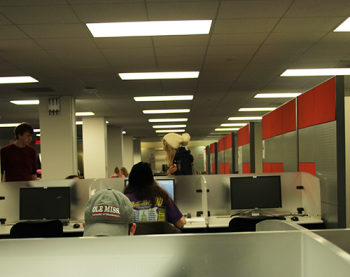 There are three group work cubicle study spaces in the Information Commons. These areas are perfect for working on a group project. Each cubicle has a large table, chairs, and a 27″ iMac. Most cubicles can accommodate four or five people. These spaces are enclosed with sliding doors and are available on a first come first served basis. Group work has priority over students studying alone. Enter the J.D. Williams Library from the West (fountain) side or come down the stairs if you enter from the second floor east (Lyceum) side. 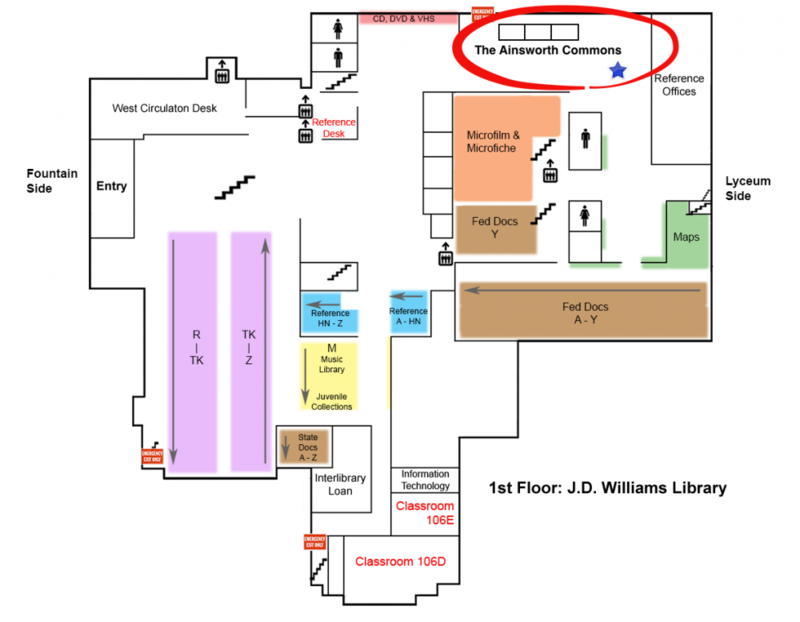 The Ainsworth Commons is located on the first floor. The group work cubicles are in the middle of the Ainsworth Commons. 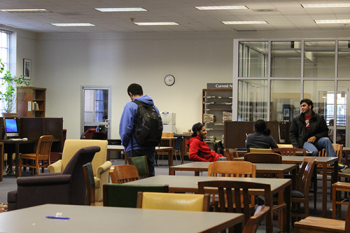 There are numerous study types of study spaces in the Information Commons. There are many PC’s available as well as scanners, copiers and printers. 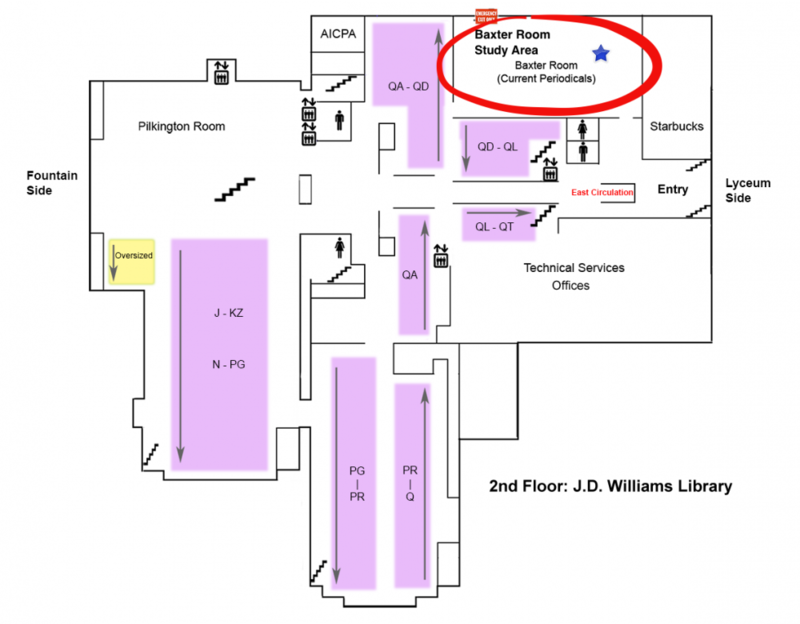 The Reference Desk is located here so if you have questions or need assistance with your research, this is the place to be. The Information Commons is an active area. Outlets are available near most work areas. This room was upgraded and furnished in 2009 through an anonymous donation to the Library. The faculty and staff at that time came up with a variety of names and voted. The “Information Commons” won the vote. We hope you like the name! The Unviversity of Mississippi Libraries would like to thank all our anonymous doners for their generous contributions to the Libraries. 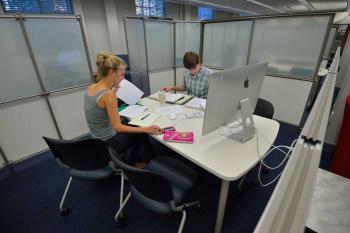 The Map Room study area has several tables and semi private carrels. It is a fairly quiet place to study on the 1st floor of the Library. Enter the J.D. Williams Library from the west (fountain) side wind your way through the building. Pass through the Information Commons, Ainsworth Commons and turn right. Down the hall you fill find the Map Room on your left. 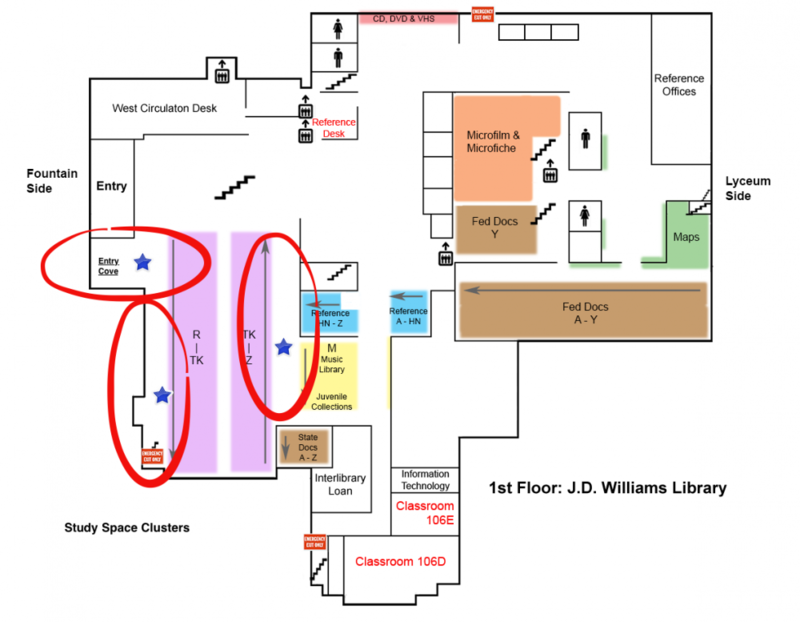 If you enter from the second floor east (Lyceum) side, come down the stairs and you fill find the Map Room on your left. 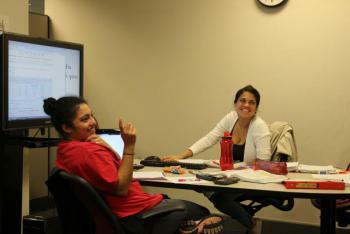 The Baxter Room is a favorite place for study. The room has several PCs and Macs available for use. The large windows make it a favorite for those who work best or need natural light. While it is adjacent to the Starbucks Coffee Shop, a sealed door passageway prevents noise from entering the room. The Baxter Room also has current periodicals as well as current newspapers. The Baxter family gave an endowment to the Library in memory of UM alumni Herman M. Baxter. The room is named for Mr. Baxter. First Lieutenant Herman M. Baxter died in the service to his country from German mortar fire in European Arena on October 16, 1944. Herman Baxter distinguished himself at the University of Mississippi in the following ways: BA 1943, Student Body President, ODK, Hall of Fame, Who’s Who in American University, Cadet Captain, Scabbard of Blade, and Vice Commander Hood’s Brigade. We thank the Baxter family for their generous gift to the University of Mississippi Libraries. Enter the J.D. Williams Library from the West (fountain) side and come up the elevator or the stairs. Go east through the Exhibit Hall and turn left at Starbucks. If you enter from the second floor east (Lyceum) side, the Baxter Room will be on your right.